Mercedes-Benz at the LA show | What Car? 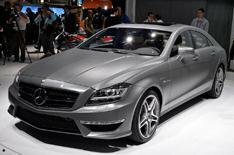 Mercedes-Benz and its AMG performance division launched what they described as the perfect two cars for the modern car enthusiast at the Los Angeles show. A limited-run hydrogen fuel-cell version of the B-Class, with zero CO2 emissions at the tailpipe and certified fuel consumption of 54 miles on a US gallon (smaller than an imperial gallon) was lined upon stage with the AMG 5.5-litre bi-turbo version of the new CLS four-door coupe. Just 200 versions of the hydrogen B-Class, named F-Cell, are being produced for real-world testing in America (primarily southern California) and Europe. They will be put out on a leasing deal which will include the hydrogen that fuels them, and Mercedes is helping to expand the hydrogen infrastructure as part of its commitment along with six other major manufacturers to have fuel-cell cars commercially available by 2015. The hydrogen mixes with oxygen in a box called a fuel stack to create electricity for the 136bhp, 214lb ft electric motor. Water is the only tailpipe emission. This is the right car at the right time and in the right place, said Ernst Lieb, head of Mercedes US operations. All the driveline components are under the floor, so interior space is unaffected. In a side-swipe at some other electric cars, which can take up to eight hours to recharge, he added: Recharging takes just three minutes the amount of time it takes to fill the hydrogen tank. The CLS 63 AMG marries the new semi-coupe/semi-saloon version of the E-Class family with the amazing 5.5-litre twin-turbo V8 AMG engine. This will not be a case of undoing all the good environmental work done by the B-Class, though. Despite a power output of 550bhp (43 more than the old 6.2-litre V8) and torque of 590lb ft (plus 125), fuel consumption is down by 32% on the American drive cycle. The AMG will make it to the UK in the first half of 2011, but its unlikely the UK will be taking part in the fuel-cell test programme due to the lack of a refueling infrastructure here.